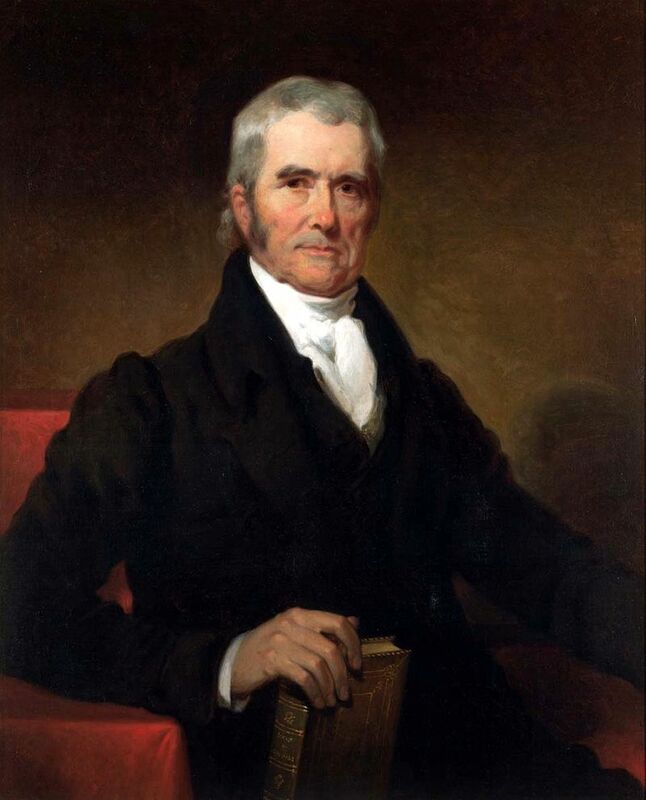 John Marshall was born on September 24, 1755 in Germantown, Virginia. He served first as lieutenant, and after July, 1778, as captain in the Continental Army in the Revolutionary War, spending the winter of 1777-1778 with the troops in Valley Forge. In 1781, he resigned his military commission, studied law, and set up his law practice in Virginia, in Fauquier County and later in Richmond. In 1786, he won an an important legal case. He thereafter maintained leadership of the bar of Virginia and was a member of the Virginia assembly in 1782-91 and 1795-1797. In 1788, he took a leading part in the Virginia convention called to act on the proposed Constitution of the United States. In 1795 he was offered the attorney-generalship by Washington and the position of the Minister to France in 1796, declining both offers. He did spend the autumn and winter of 1797-98 in France. Marshall, along with Charles Cotesworth Pinckney and Elbridge Gerry, had been appointed by John Adams to negotiate with France, which was embroiled in a war with Britain, during the course of which it had seized American vessels. Tensions between the nations were high and the threat of war loomed. Although a war with France was averted, relations between the nations remained strained for years. Back in the U.S., growing public hostility to France and resentment for the way he and the other members of the commision were treated by the French made Marshall exceedingly popular. This popularity and the advocacy of Patrick Henry aided his election to the House of Representatives in the spring of 1799, as a Federalist in a district heavily favoring the primary opposition party, the Democratic-Republicans. He was Secretary of State under Adams from June 6, 1800 to March 4, 1801. In the meantime he had been appointed Chief Justice of the Supreme Court, his commission bearing the date January 31. Thus while still Secretary he presided as Chief Justice. After the death of George Washington, as an expression of his love and loyalty, Chief Justice Marshall hastily composed a biography of his revered chief (1804-07). It contained five volumes. In 1832 he shortened the work to two volumes with an introductory book of Colonial history. In 1782, Marshall married Mary Willis Ambler, the daughter of the treasurer of Virginia. They had ten children, six of whom grew to full age. Mary died in 1831 and he was never quite the same again. On returning from Washington in 1835, he was in a stagecoach accident, suffering severe injuries. His health, which had not been good, rapidly declined and in June he returned to Philadelphia for medical assistance. There he died on July 6. His body was taken to Richmond and he was buried in Shockhoe Hill cemetery. 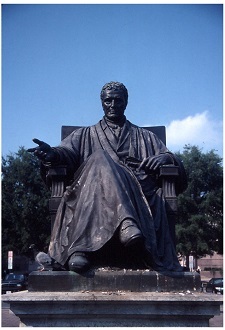 As a tribute to his judicial service a bronze statue stands on the lower west terrace of the Capitol. It represents the Chief Justice, sitting in his judicial robe, expounding some subject of great interest to him. The statue looks toward the monument of Washington whom he so greatly admired.